I love sailing. There's just something about being out on the water. 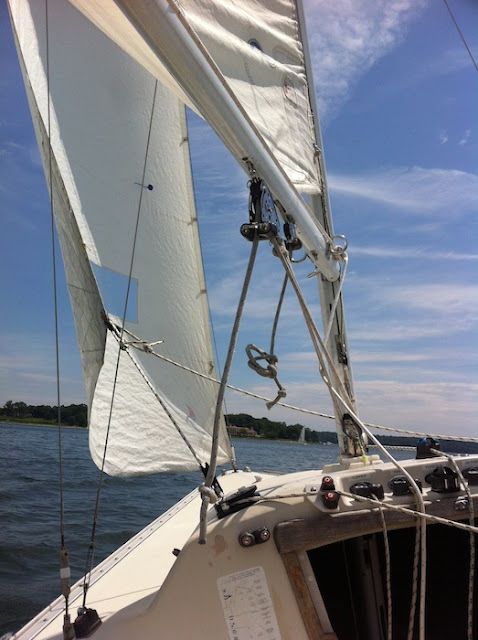 On Sunday JD and I went sailing with our friend Nick in Oyster Bay. It was our second time out this season and things went much better than last time After not sailing all winter there was a little bit of confusion the first day out, and a few small miscommunications. For example, we had been sailing for a few minutes before realizing that no knots had been tied at the end of the jib sheets. We were lucky there wasn't much wind, otherwise we would have had to catch the jib and most likely fish it out of the bay, which would have been quite the embarrassing little spectacle. But the wind was good on Sunday, and we got back into the checklist routine quickly. We even got to sit up on the rail, which honestly is my favorite part. Of all of the things that JD loves to do that terrify me (i.e. rock climbing, ice climbing, riding in the bike lane on any street in Manhattan), hanging off the side of a boat is what I look forward to most. It makes him nervous. Go figure. I cannot wait to take our little 420 out, and eventually get a trapeze and start racing. That probably sounds crazy, but I'd really like to get good enough to race. JD checking the sails, with a rainbow cloud behind him. It was one of the coolest things I've seen. It changed colors depending on your position to it. A little to the right and it was all blues and greens. i'm with you, sailing is just so relaxing. lucky you, looks like a great time!